Views | Are small states more successful? 1 min read . Updated: 23 Nov 2011, 12:24 PM IST Sunil B.S. The Uttar Pradesh cabinet has given its nod to the proposal to divide the state into four, a move that it says will improve governance. Soon after independence, India had more than 500 small states that were then integrated into 28 units along linguistic lines. In subsequent reorganizations, Haryana was separated from Punjab in 1966. Some parts of Punjab were given to Himachal Pradesh in 1960. Arunachal, Meghalaya, Assam and Mizoram were carved out of Greater Assam in 1971. Uttaranchal, Jharkhand and Chhattisgarh were formed out of UP, Bihar and Madhya Pradesh in 2000. Are smaller states more efficient? Are they governed better? 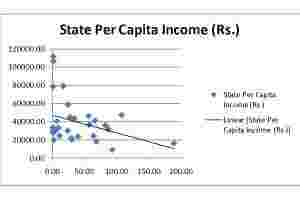 Take a look at the chart, which is a scatter diagram based on the population size and per capita incomes of various Indian states. This data suggests a negative correlation (though there is no proof of a causal link), with smaller states tending to be the richer ones. Some anecdotal evidence as well as comparative growth figures suggests that the most recent states -- Uttarakhand, Chattisgarh and Jharkhand -- have been growing faster than their parent states (UP, MP and Bihar, respectively).